Harman’s JBL Professional today announced the introduction of its 9320 Cinema Surround loudspeaker, a large-format loudspeaker designed for high power handling, extended bass response and wide dynamic range in professional cinema applications. The 2-way JBL 9320 features a 12-inch MB12-8 low-frequency driver and 2408H-1 high-frequency compression driver. The large JBL Progressive Transition™ rotatable waveguide ensures superior 120 x 60 degree coverage and smooth frequency response with the loudspeaker mounted horizontally or vertically. The high-excursion, heavy-duty MB12-8 low-frequency driver provides high power-handling capability and bass extension. The proven, industry-standard 2408H-1 high-frequency compression driver delivers exceptional clarity and resolution and is mated with JBL’s Progressive Transition Waveguide, which provides constant beamwidth and directivity across a 120-degree horizontal/ 60-degree vertical coverage pattern, along with smoother frequency response and a more seamless blend with the woofer. The waveguide is rotatable, enabling the 9320 to be used a vertical or horizontal mounting position. 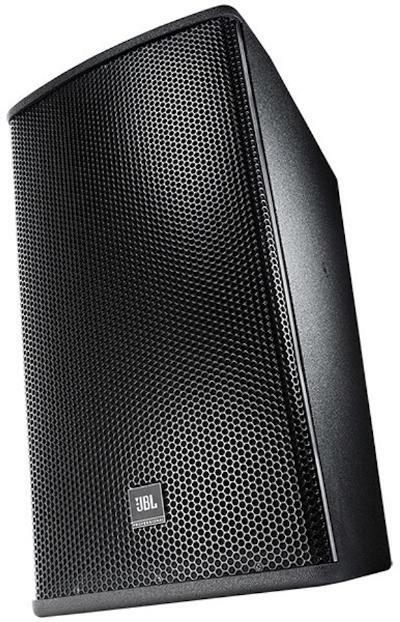 The JBL 9320 enclosure is fitted with M10 threaded mounting points on the top and on the sides to facilitate U-bracket mounting. In addition, four M10 mounting points are located at the rear, arranged in a standard pattern to accept a variety of multi-mount brackets. The speaker terminals are located on top of the cabinet for easy access. The 9320’s enclosure is constructed of multi-ply birch coated with JBL’s rugged DuraFlex™ finish and is heavily braced to maximize low-frequency performance. A steel grille protects the drivers and gives the 9320 an understated, professional appearance.